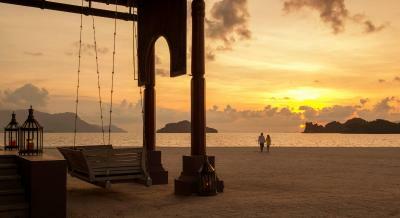 Lock in a great price for Four Seasons Resort Langkawi – rated 9.1 by recent guests! 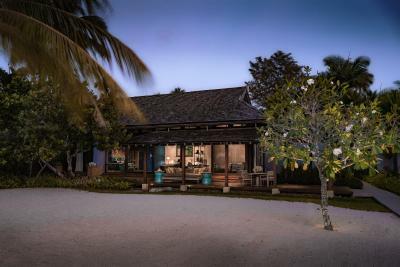 Magical location, spacious and modern villas on the beach, extremely attentive service and superb calm ambiance for relaxation. Amazing hotel with a lot of seclusion and privacy, excellent architecture with many great picturesque locations, great check-in experience which immediately uplifts your mood, extremely friendly staff who makes you feel like king & queen. Wild life around resort is great and very diverse and fun to watch for nature lovers. The staff was excellent and as we were celebrating our Honeymoon, they surprise gifted us a bottle a bubbly to our room while we were out. Everything about this place is astonishing. Apart from the amazing views, resort ambience and setting, and apart from all the natural beauty, the best thing of all is the staff! They treat you like family and are overwhelmingly nice making one feel very pampered. Breakfast buffet is incredible. Staff is super attentive. Rooms are gorgeous. Swimming pool, restaurants and a lot of facilities are perfect, next time I will come back I stay there. Pools, food, beach, peaceful, private feel, gym. All marvelous! 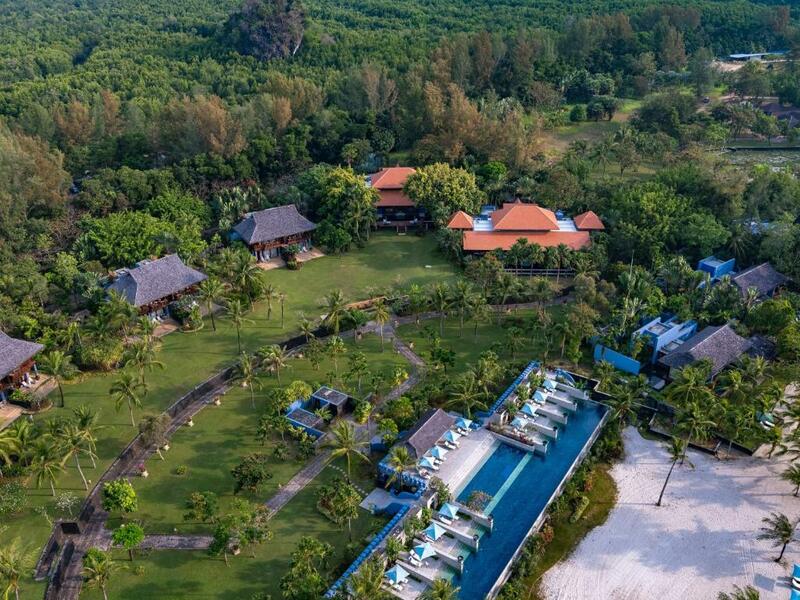 Four Seasons Resort Langkawi This rating is a reflection of how the property compares to the industry standard when it comes to price, facilities and services available. It's based on a self-evaluation by the property. Use this rating to help choose your stay! 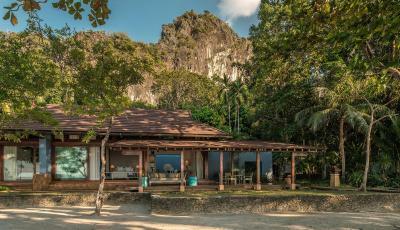 One of our top picks in Tanjung Rhu – and a guest favorite. 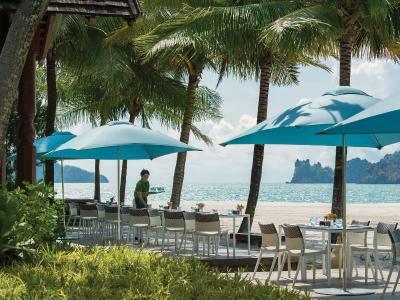 Boasting a mile-long private beach and multi-tiered outdoor pools, Four Seasons Resort Langkawi is surrounded by landscaped gardens and lush forests. 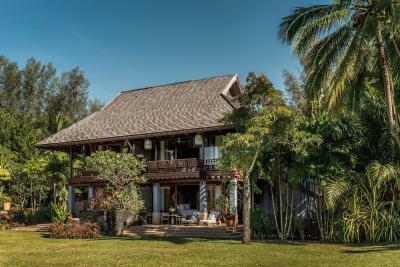 This beachfront property offers spacious villas and pavilions with free WiFi throughout. It also houses 3 dining restaurants, a bar and a spa. 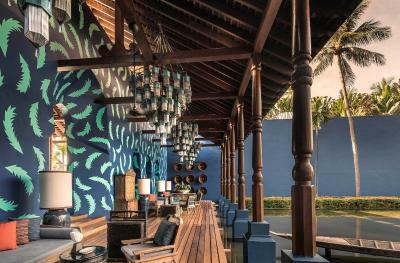 Inspired by Malay and Moorish architecture, every unit is well-appointed wooden furnishings and high ceilings. A flat-screen TV and an espresso machine are provided. The private bathroom includes organic toiletries and yukata robes. Certain units feature an outdoor shower while some are fitted with a hammam-style bath. Guests enjoy garden or sea view. 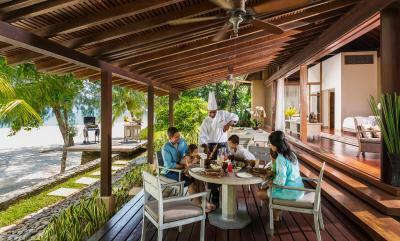 Overlooking the Andaman Sea, Ikan Ikan serves Malaysian and Asian cuisines, while Mediterranean dishes are offered at Serai. You can have wood-fired pizzas and fresh seafood at Kelapa Grill. Evening cocktails can be enjoyed at Rhu Bar, which has extensive beer and wine options. Room service and private dining experiences are available. 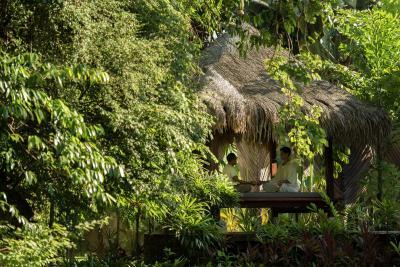 Pamper yourself with relaxing treatments at Geo Spa or join a daily yoga class. Children can enjoy various indoor and outdoor activities at the Kids' Club, while adults can enjoy a quiet time at the 150 feet seaside adult pool. Multilingual staff at the reception are ready to assist you with any inquiries any time of the day. 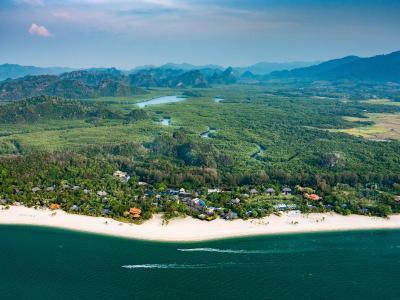 Langkawi Wildlife Park is 6.8 mi from Four Seasons Resort Langkawi and Gunung Raya Mountain is 14 mi from the property. Langkawi International Airport is 11 mi away. 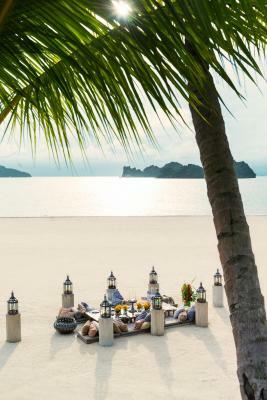 When would you like to stay at Four Seasons Resort Langkawi? 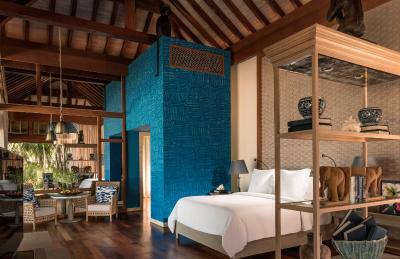 Inspired by Malay architecture, this air-conditioned room is located on a higher floor. 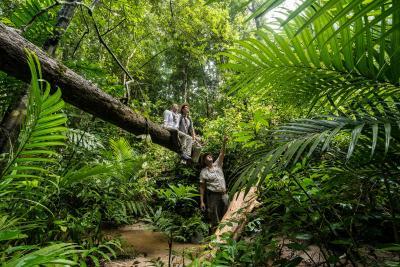 It is fitted with high ceilings, a balcony overlooking the rainforest and a day bed. An espresso machine and bathrobes are also included. The large marble bathroom is appointed with organic toiletries and a hammam-style bath. Breakfast is for 2 adults only. Children above 4 years old are charged separately for breakfast. Steps from the beach, this air-conditioned villa features a plunge pool with whirlpool. 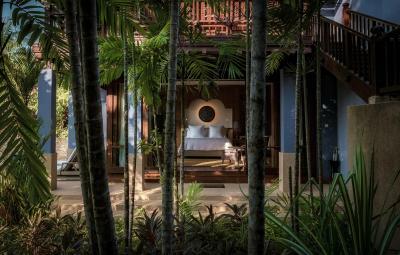 Inspired by Malay and Moorish architecture, it is fitted with a beach hammock and a day bed. 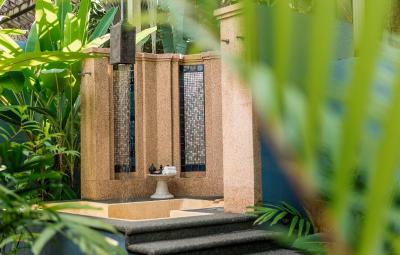 The large marble bathroom is appointed with organic toiletries and a hammam-style bath. An outdoor rain shower and bathrobes are also included. Featuring a patio partially overlooking the sea and direct beach access, this air-conditioned room is located on the ground floor. Inspired by Malay architecture, it is fitted with an iPod docking station and a hairdryer. The large marble bathroom is appointed with indoor and outdoor showers. It also features organic toiletries and an outdoor terrazzo bath. 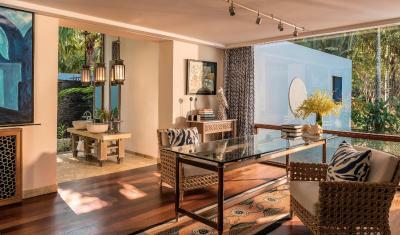 Featuring a balcony partially overlooking the sea, this air-conditioned room is located on a higher floor. 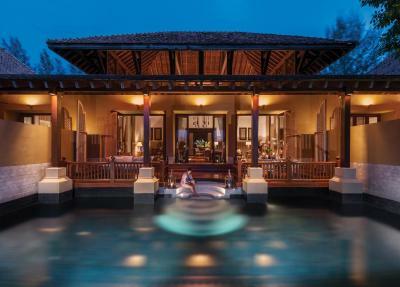 Inspired by Malay architecture, it is fitted with an espresso machine and bathrobes. The large marble bathroom is appointed with organic toiletries and a hammam-style bath. 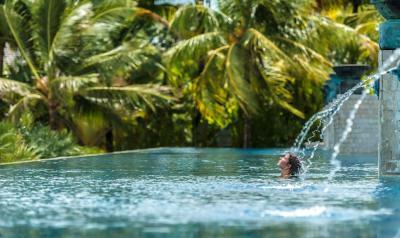 Steps from the beach, this air-conditioned family villa features a plunge pool with whirlpool. 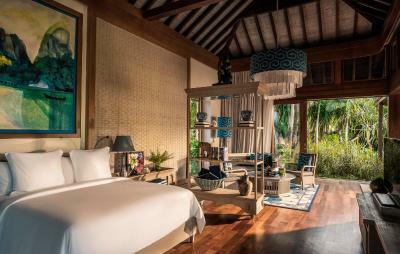 Decorated with high ceilings and wooden furnishings, it has children's amenities such as beach toys and sandcastle kit. A day bed and an outdoor dining area are also available. The large marble bathroom is appointed with organic toiletries and a hammam-style bath. An outdoor rain shower and bathrobes are also included. 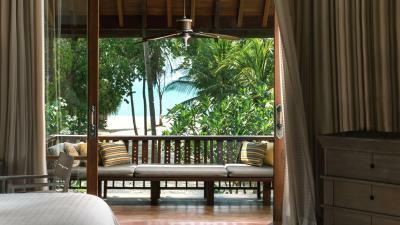 Inspired by Malay architecture, this air-conditioned twin room is located on the ground floor. It is fitted with a patio overlooking the garden and a flat-screen TV. An espresso machine and bathrobes are also included. The large marble bathroom is appointed with indoor and outdoor showers. It also features organic toiletries and an outdoor terrazzo bath. 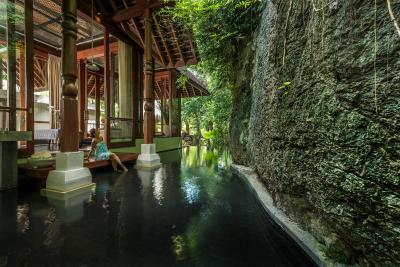 Inspired by Malay architecture, this air-conditioned room is located on the ground floor. It is fitted with a patio overlooking the garden and a flat-screen TV. An iPod docking station and a hairdryer are also included. The large marble bathroom is appointed with indoor and outdoor showers. It also features organic toiletries and an outdoor terrazzo bath. This spacious villa features a beachfront infinity pool. Consisted of 2 separate pavilions, each comes with a spa and large bath. The common area includes a 10-seater dining table and a well-equipped kitchen. Guests enjoy complimentary butler service. 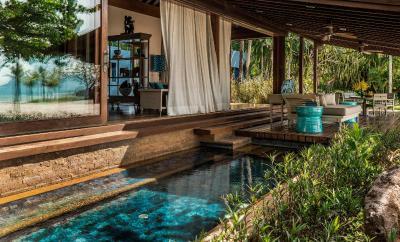 Steps from the beach, this air-conditioned family villa features a plunge pool with whirlpool. Fitted with 2 bedrooms and 2 bathrooms, it has a video-game player and a TV. A day bed and an outdoor dining area are also available. The large marble bathroom is appointed with organic toiletries and a hammam-style bath. An outdoor rain shower and bathrobes are also included. 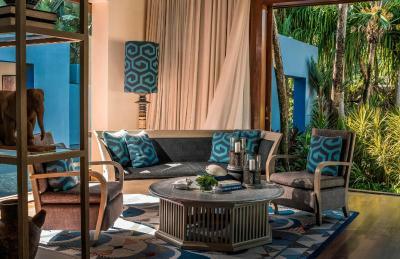 Steps from the beach, this air-conditioned family villa features a plunge pool with whirlpool. Fitted with 3 bedrooms, it has children's amenities such as beach toys and sandcastle kit. A day bed and an outdoor dining area are also available. The large marble bathroom is appointed with organic toiletries and a hammam-style bath. An outdoor rain shower and bathrobes are also included. 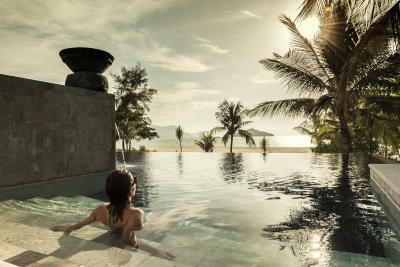 House Rules Four Seasons Resort Langkawi takes special requests – add in the next step! Any additional older children or adults are charged MYR 451 per night for extra beds. 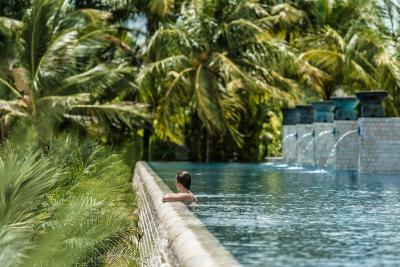 Four Seasons Resort Langkawi accepts these cards and reserves the right to temporarily hold an amount prior to arrival. For reservations made from 1 March 2018, rates are inclusive of a compulsory gala dinner on 24 December 2018 and 31 December 2018. Any extra guests are charged separately and are to pay directly to the hotel. The rooms were really nice. The resort was very quiet and relaxing. Beach long and beautiful. Staff extremely helpful and polite. Big compound with lots of privacy and wild life like resident monkeys as well as squirrels. 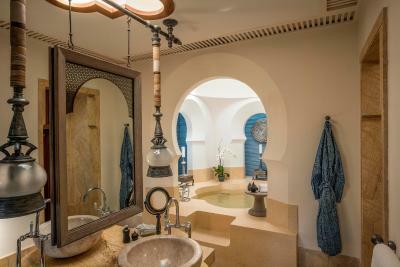 Nice Moroccan style bathroom with a huge spa like bath with natural light. Was surprised by the amenities n champagne from the hotel for our wedding anniversary! The resort is amazing, the adult pool is perfect, staff so lovely, breakfast totally delicious and rooms are really lovely. The food is extremely expensive and it may be worth packaging dinner with your accommodation if you are not going to leave the resort. The resort is very spread out and lacked some atmosphere. Great service, very attentive and could anticipate needs. Lovely food. Superb staff who went the extra mile. Fixed a child’s slog shot & showed them fossils in rocks just outside the property. Highly environmental & the only hotel on the island to clean the rubbish from the mangroves. The calmness n quiet of the resort.